Reproductive health is a state of physical and mental well-being in relation to the reproductive system and its functions and processes. Means of achieving reproductive health include education and services during pregnancy and childbirth, safe and effective contraception, and prevention and treatment of sexually transmitted diseases. Complications of pregnancy and childbirth are the leading cause of death and disability among women of reproductive age in developing countries. Adolescent fertility rates are based on data on registered live births from vital registration systems or, in the absence of such systems, from censuses or sample surveys referred by the World Bank. 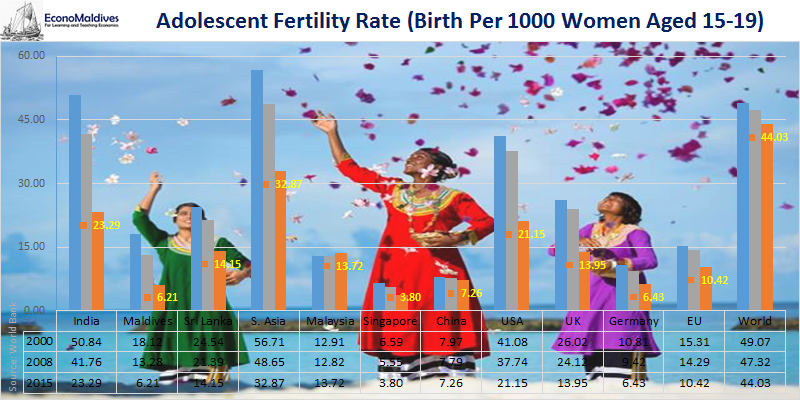 According to World Bank statistics, Singapore has the lowest Adolescent Fertility Rate among the selected countries and Maldives stands at second lowest, even below the EU Average. 21st century Maldivians do not usually get married at adolescent age.